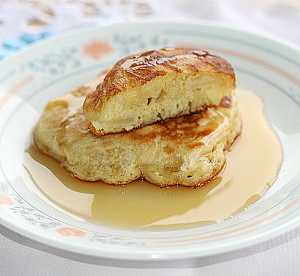 I created this recipe based on my childhood memory of Apple Pancakes, my Godmother used to make, and she called them “Ratsushki”. 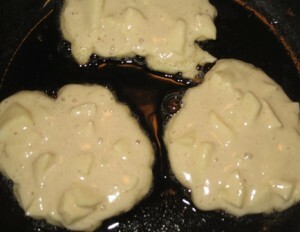 They are pan fried Apple Fritters (pancakes), using regular all purpose flour, rather then premixed pancake mix. I prefer these over the pancakes from a mix, since they do not absorb as much of the pancake syrup. I also love the taste of the fresh cooked apples (or any fruit) intertwined throughout the pancakes. Very easy to make, and delicious to have any time of the day, not just for breakfast (sometimes I grab a cold one, as a snack). These also freeze very well, and are great thawed and heated up on the pan, or in a toaster oven. This recipe yields about 12 pancakes, 4 inch in diameter. Two heaping spoonfuls of pancake batter per pancake, cooking in hot oil. 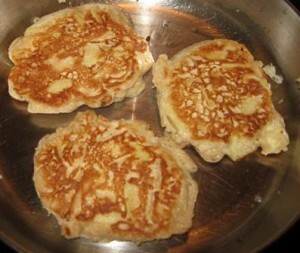 Once the edges are getting golden and air bubbles forming on top of pancakes, it is time to flip them over. Once side done, and the other side is cooking to perfection. Sift the flour with salt, baking soda, baking powder, and sugar. Place the eggs and milk in a mixing bowl, and beat medium speed, 2 minutes. Mix in the melted butter, and vanilla extract. Gradually add the flour mixture just to incorporate, do not over mix. Peel, core, and dice, the apples. Add cinnamon to apples (optional). Let the batter rest few minutes, while your oil is getting hot. Heat 2 Tbs vegetable oil on medium heat (see TIP). Drop about 2 heaping tablespoons ( or use a gravy ladle) of pancake batter onto hot oil, spacing them about 1 inch apart, so they don't stick together during cooking. Fry a minute or so, until edges are getting golden, and small air bubbles are forming and breaking up on top of the pancakes. Using a spatula, flip them over (away from yourself, to avoid oil spatter on you) on the other side, and fry a minute longer, or until do raw batter is visible. Remove from the pan onto paper towel, to soak up any extra oil. Serve hot with your choice of syrup, jam, or other fresh fruit and whipped cream. To test your oil for readiness, once you see the oil begins to move round slightly, drop a small drop of batter onto the pan, and if it starts to sizzle and bubble around it, the oil is hot enough for frying. You may also choose cooking spray over oil. After having these many times at Lisa & Orest’s, I finally tried whipping them up for myself and the results were ABSOLUTELY TO DIE FOR! I cannot thank you enough for this AMAZING – and surprisingly easy to make – recipe! Now I am wondering if you could make a variation with buttermilk and chocolate chips. I am too scared to try it myself though because I do not know if I should be omitting the baking soda and/or baking powder. 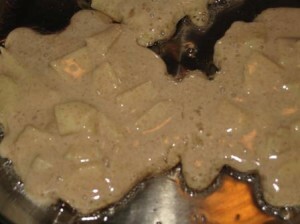 I am very pleased to know that you enjoy these Pan Apple Fritters (pancakes), as much as my family does. I would suggest to omit the baking powder, but increase the baking soda to 1 1/2 tsp, to make them fluffy. I will make them later on today, using buttermilk and chocolate chips, and let you know how they turned out. If you already tried using these ingredients, please share your comments. Thank you so much for reading my posts, and taking time out of your busy schedule to leave a comment. 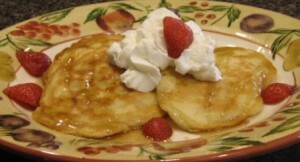 Thanks for this recipe.. Made them this morning and they were a hit with my granddaughter that I am Babysitting in NJ.. I made small ones at the end and stuck Raisins into the dough as they were cooking! They then became snow men that she is learning about in school! Awwww….you are such a creative grandma cook……making snowman out of pancakes…. Great idea! Your granddaughter must have been so happy. My grandkids like these pancakes with blueberries as well as apples.